Jonathan Tsipis gives direction during a tight game. Photo courtesy of George Washington University Athletic Communications. Jonathan Tsipis is in his fourth year as head coach at George Washington University. He comes off of a stellar 2014-2015 season that saw the Colonials get a 29-4 overall record and a 15-1 Atlantic-10 record, for their first NCAA Tournament berth since 2008. 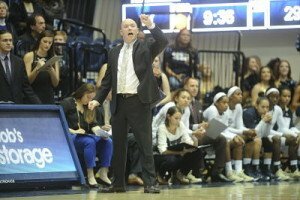 Tsipis (SIP-iss) was named conference coach of the year. 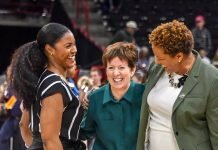 Prior to coming to GWU, Tsipis spent nine years at Notre Dame as assistant coach to Hall of Famer Muffet McGraw, including the last four years as associate head coach and recruiting coordinator. 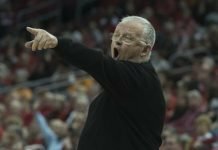 Tsipis got his start on the men’s basketball side as an undergraduate assistant at Duke, an assistant coach at Elon, assistant coach at Le Moyne College, was on the staff at Cornell, and he served as director of basketball operations at North Carolina-Greensboro, under Fran McCaffery. His father Lou played for the Greek National Team and is a member of the Naismith Memorial Basketball Hall of Fame. Tsipis and his wife Leigh have two children. Sue Favor: What first attracted you to coaching? Jonathan Tsipis: I’m from a basketball family. My dad was born in Athens and was on Greek National team when he was 15. My grandfather was the chief of police of Athens, and he helped sneak my dad out of the country. He finished his time in high school in the U.S., at Baldwin-Wallace College. When I was young he was into officiating, coaching – everything. We never had a baby sitter – just a game they took me to. It was a lot of fun. Dad is very Greek-looking dark-skinned, and I don’t look anything like that; I got my mom’s Irish coloring. He reffed lot of inner city Cleveland games, where we lived. Sue Favor: You coached men’s basketball for several years before switching to women’s basketball. Why the change? Jonathan Tsipis: It ended up being a connection. I was in the spot where I was coaching men and pursuing a Master’s degree, and I thought that was the direction I was going. I was working for Fran McCaffery, who was close to Muffet’s assistant at Notre Dame. Muffet had called him because she had always had diversity on her staff; she had always thought outside of the box with regards to diversity, ethic background or whatever. She said to Fran, if you know someone who would be a great assistant coach, let me know. He talked to me and that turned into two long phone calls. I drove to the Final Four that year and introduced myself, and I was offered a job after my interview. So I got married, got a job and we had a daughter, all in 18 months. Sue Favor: Hall of Fame coach Muffet McGraw is one of the game’s greats. What did you learn from her in nine years on her coaching staff? Jonathan Tsipis: To see somebody who’s achieved success at a high level understand the concept of being a continued learner. 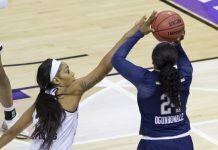 How she was able to get a Final Four in 1997 was very different from how they won a championship in 2001. When the one in charge is wanting to meet and watch games and learn about basketball from other coaches – that is really something. Whether it was going to other practices or meeting with others, she wanted to learn from people. Being an introvert, she treats all people the same way. She’ll ask an NAIA coach what they do on defense just as much as someone at the top of the game in Division I. She knows who she has to have around her to balance her out. Sue Favor: How do you lay the foundation for a successful program? Jonathan Tsipis: A big part is the structure. We work hard on getting kids who like challenges; then you can hold kids more accountable. We want kids who are really driven. You have to be a great communicator, because understanding today’s student athlete is much different from when I got here four years ago. We try to approach it in a simple day-by-day mentality. Are we getting better every day as a team? People set goals long-term and don’t think about the steps it takes to get to them. Last year we went to the WNIT. We need to build on that. Sue Favor: What is the best thing about your job? Sue Favor: You are always described as being very positive and having positive energy. How would you describe your coaching style? Jonathan Tsipis: I’m somebody that’s a confidence-builder, I got to work under Muffet as well as (Notre Dame men’s basketball coach) Mike Brey, and they are both very positive. I’m trying to get kids to a point where they can be better than they ever realized. We’re trying to be in that position from a psychological aspect. I’m very enthusiastic, but I think I clap more in a single practice than most people do in a week. Once you’re done with practice and a game, your players need to see you in a setting that’s different. I like being there for them academically and socially – I think that’s really important. Sue Favor: What is the most important thing to impress upon the student athletes you work with? Jonathan Tsipis: The ability to do more together as a group. That’s why sports in general teach so many great life lessons. If things aren’t going your way basketball-wise, that’s also going to prepare you as a parent, a spouse, and in the workplace. If you get kids ready to come together, deal with conflict resolution, it gets kids ready for their whole lives. You can get caught up in the winning, but the best is when a kid graduates and can come back and talk to the team, whether they’re overseas or in the work force. Sue Favor: When you are recruiting, what qualities do you look for in players? Jonathan Tsipis: Someone who’s involved in leadership even outside the basketball realm. Are they active in other things, whether it’s a school group or church, so they understand how a group dynamic works? I’m big on seeing how they handle adversity. Obviously I want kids who can catch, pass and dribble, but as we deal with the trophy generation and participation, I really want to see kids where a loss is something that affects them. Our first class who are juniors now, what brought them together for me is that they’ve all been part of championships. It’s something that Muffet really looked hard at is, are they competing at the championship level? Sue Favor: What is your favorite down-time activity? Jonathan Tsipis: It’s a split between my kids. I wrestle with my nine-year-old son, and with my daughter, my favorite thing to do with her is for her to tell me all the different things she’s doing in school. That part of our bond is for her to tell me what she’s done. My son loves to watch WWE, and my daughter likes to talk. My kids are around our team and it’s really funny. The three seniors have seen the kids grow. I challenged them when I got the job that my kids now had 13 older sisters.